Some subscribers won’t open your email campaigns for a period of time. If that’s the case, consider targeting them with a series of re-engagement emails. Automations are a great way to send your email campaigns without taking time away from your other tasks. In this article, you'll learn how to use automations to re-engage inactive subscribers. If you’ve never created an automated email before, review About Automation. You may want to first learn how to identify and segment inactive subscribers before targeting them with an automation. 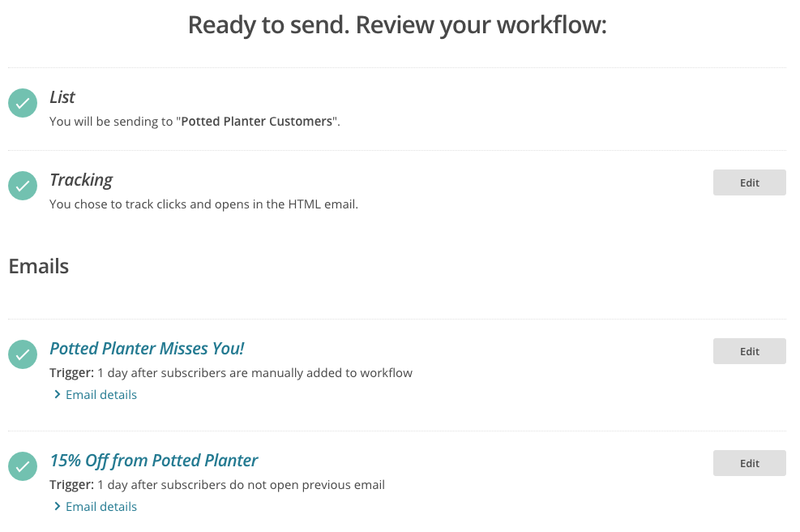 Design a series of two or more emails for your automation. Set up your email triggers and delays for your campaign. Manually add inactive subscribers to your email series. A re-engagement automation is a special type of email series that will automatically send to people you’ve identified on your list who haven't opened your recent content. Ideally, you would send emails that would encourage them to click, such as a special promo code or coupon. Then, if they don't open the first email in your email series, send them additional follow-up emails. This gives them multiple opportunities to engage with your brand. A re-engagement series works a little differently than most automations in Mailchimp, and the setup process can be a bit tricky. To get started, you'll identify people on your list who are inactive. We define inactive subscribers as people who don’t open your emails over a period of time. These people can still be valuable to your business, especially when using our other marketing tools. Plus, it’s easier to win back the interest of those already subscribed to your list as opposed to trying to attract new subscribers. After identifying your inactive subscribers, you'll use our custom automation feature to design a series of two or more emails for that audience. Finally, you'll set up your email triggers and delays so Mailchimp can send to the right people at the right time. To create a new automation, follow these steps. Click Custom to create a campaign from scratch. Enter a campaign name and click the drop-down menu to choose a list. Now you’re in the Automation Builder, where you’ll set up and design your re-engagement series. In the Emails step of the Automation Builder, you'll design an email series and edit each individual email's settings. 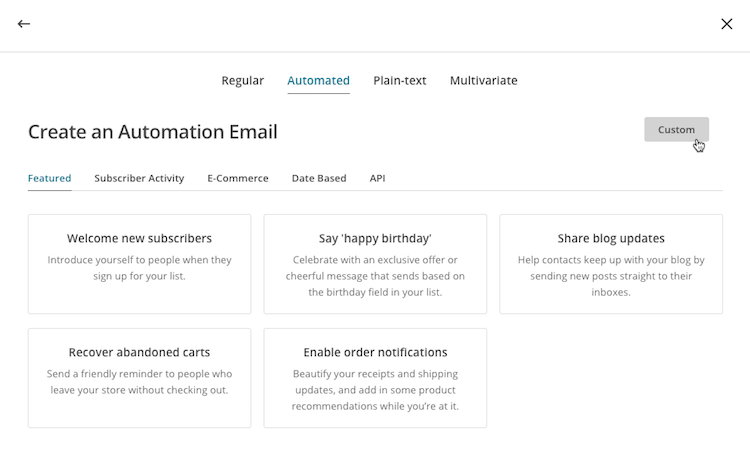 To begin, your custom automation starts with just one email, which we’ll call email 1. It has a few default settings. Delay Email 1 has a one day delay. This means your email will not send until the day after your subscribers qualify for the workflow. Trigger Email 1 has a manual add trigger. This means it won’t send until you add inactive subscribers to your workflow in your Mailchimp account. To create a series, you’ll design your email, then add and design another email, which we’ll call email 2. Email 2 should have a few specific settings. Delay Email 2 can have a delay of your choosing. This means you can trigger the email to send one or more days after your subscribers qualify for it. In our example, we’ll use a 3 day delay. Trigger Email 2 should have a Previous email not opened trigger. This means it’ll only send to people who did not open Email 1. Here’s how to add an additional email to your series using the correct trigger. Click Add Another Email after the first email. On the Select a new trigger screen, click Workflow activity. Click the Previous email not opened trigger. Update the Delay and Settings for the new trigger if necessary. Now that you’ve updated your trigger settings, you’re ready to add subscribers to your workflow. After you’ve designed and edited the emails in your automation series, you’ll need to start and pause the automation to add inactive subscribers. To add inactive subscribers to your automation, follow these steps. On the Confirm step of the Automation Builder, review the checklist and test each of your emails if you haven’t already. When you’re ready, click Start Workflow. Because your automation series begins with the manual add trigger, you won’t be sending to anyone just yet. Find your new re-engagement automation and click Edit. Click the drop-down menu next to Edit workflow settings, and choose Add subscribers to workflow. If you’ve previously created a segment for your inactive subscribers, click the radio button next to Subscriber is a member of saved segment to choose your segment, and skip to step 9. Otherwise, click the radio button next to Subscribers match the following conditions. Choose the parameters Campaign activity, did not open, and whichever option best fits your needs. 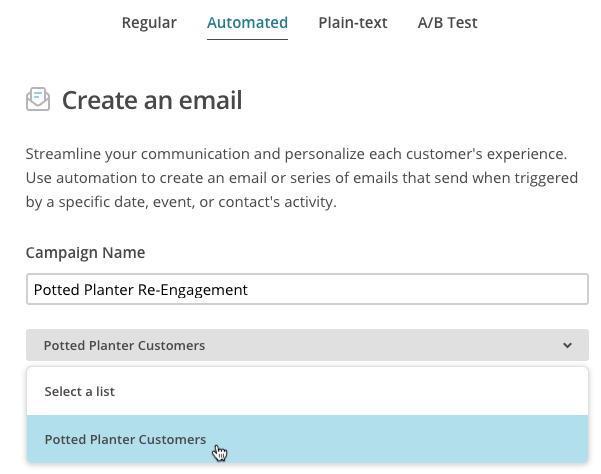 Create a second condition with parameters Campaign activity, was sent, and a specified condition to ensure that you only capture those who received, but did not open your emails. Click Add Subscribers to Workflow. Nice job! Your segment of inactive subscribers will soon receive the first email of your re-engagement automation. While we’d love for every subscriber to open your emails, we understand that not everyone will engage with your campaign (even if you’re offering a 25% off coupon!). Instead of removing inactive subscribers altogether, consider unsubscribing them from your list. When contacts make it all the way through your re-engagement series without opening any emails, you may want to add a post-send action to the final email to automatically unsubscribe them from your list. Unsubscribed contacts can still receive transactional emails and other types of Mailchimp campaigns. Plus, you may reduce the cost of your monthly plan by cutting your total subscriber count. Learn how automation works and get tips for how you can use automation to streamline your work. Removing inactive subscribers can lower your subscriber count and costs. Learn how to segment inactive subscribers so you can re-engage or remove them.